Home Styles Biscayne Arm Chair is constructed of cast aluminum with a white finish and Sunbrella <sup></sup> Green Apple fabric Cushions. Features include powder coat finish sealed with a clear coat to protect finish, and nylon glides on all legs. Chairs are packed two per carton. Chair Size: 22.6w 22d 33h. Seat height 15.5h. Stainless steel hardware. 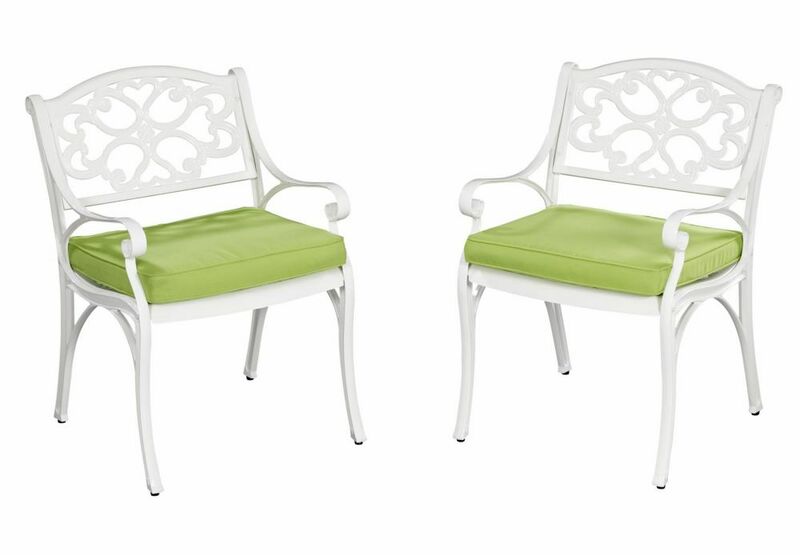 Biscayne Arm Chair in White with Cushion (Set of 2) Home Styles Biscayne Arm Chair is constructed of cast aluminum with a white finish and Sunbrella <sup></sup> Green Apple fabric Cushions. Features include powder coat finish sealed with a clear coat to protect finish, and nylon glides on all legs. Chairs are packed two per carton. Chair Size: 22.6w 22d 33h. Seat height 15.5h. Stainless steel hardware.